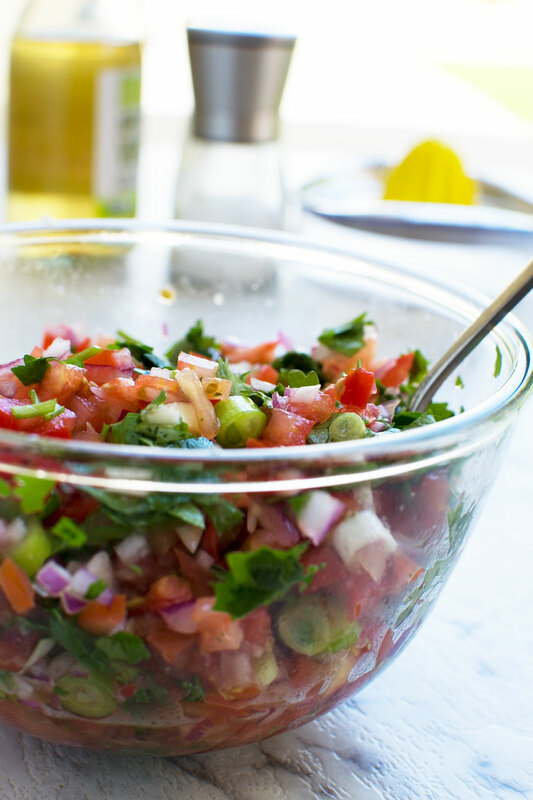 Next time you’re tempted to buy salsa from a supermarket, why not have a go at making your own fresh tomato salsa at home? 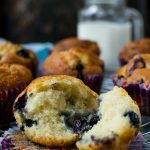 It only contains 6 simple ingredients, takes 10 minutes to make, and tastes fresh and healthy. You’ll never look back! 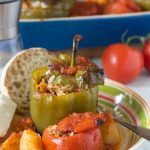 Just recently, I discovered a gourmet supermarket that stocks wonderful ready prepared foods. The one thing Mr Scrummy and I couldn’t resist buying was a big tub of homemade salsa and a huge bag of tortilla chips to dip into it. 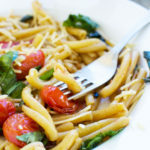 It was delicious, but a bit expensive, so I decided to try to guess what was in it and make my own version at home. 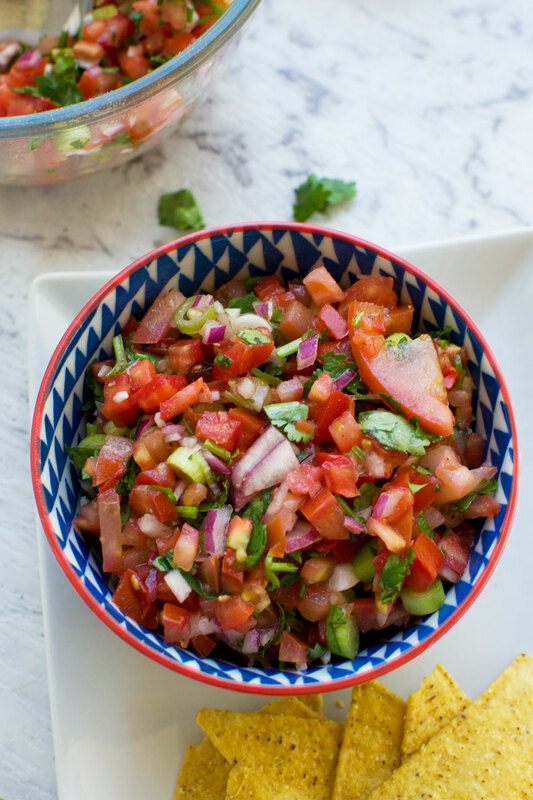 The result is this 10 minute fresh tomato salsa! This is a very SIMPLE SALSA. 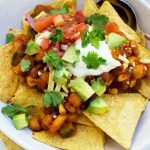 To be honest, when we have a meal that salsa goes well with, like these 5 bean chili loaded nachos, I usually just dice some tomatoes and onions and add a drizzle of olive oil. Generally I think this is a neat hack. I only have 30 minutes to an hour (maximum!) to prepare dinner, so I don’t have time for anything else. HOWEVER, if I’m just pulling something from the freezer (again, like 5-bean chili! 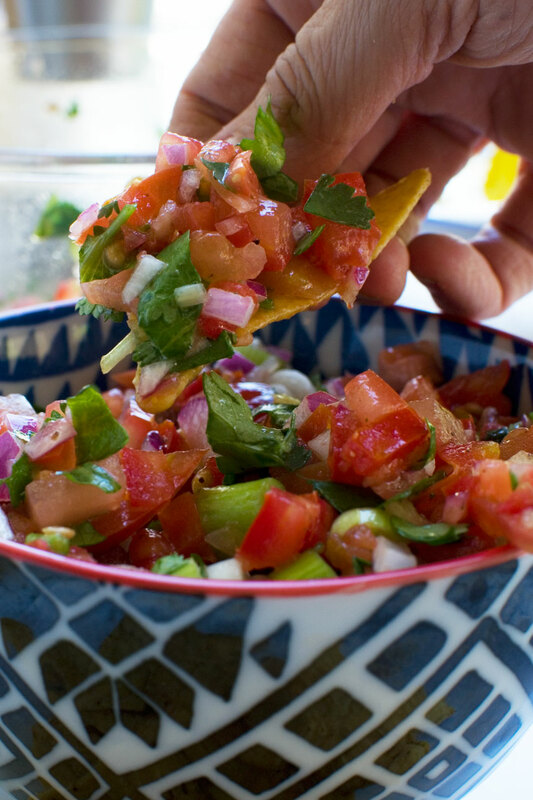 ), I sometimes go the extra mile and make this simple 10 minute tomato salsa. Sometimes I make it ahead and pop it in the fridge ready for that night’s meal. So how do you make a tomato salsa? 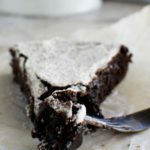 So yes, just 6 ingredients! 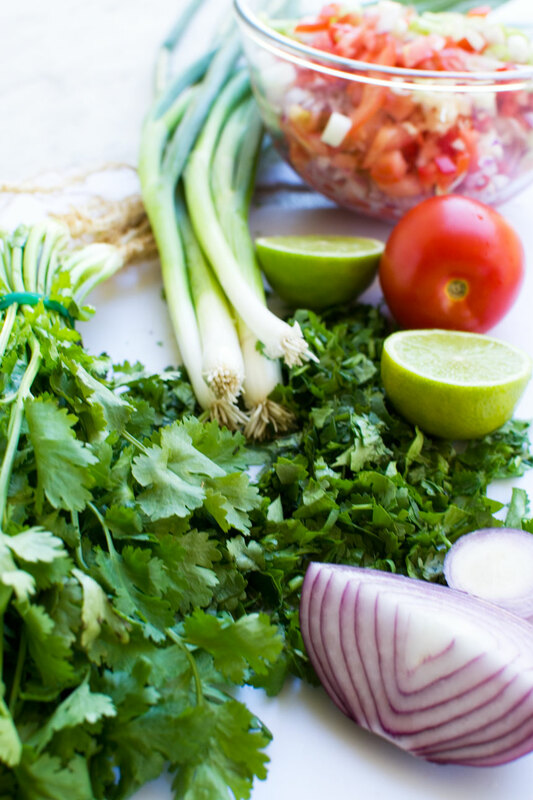 Don’t worry if you don’t have salad onions – just leave them out – and you could use lemon juice if you don’t have any limes. How long does tomato salsa keep for, and can you freeze it? I’ve never frozen salsa before, but it’s fine to do so. There might be a bit more watery liquid in it after you’ve defrosted it, but you can easily drain it off. 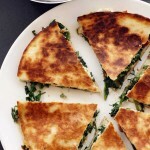 serve it with quesadillas, tacos, or something else ‘Mexican’! 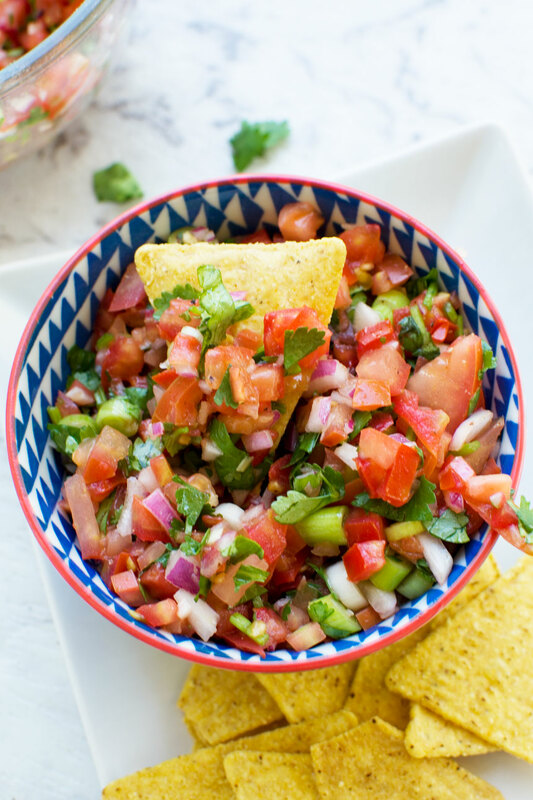 We often eat this 10 minute tomato salsa with my 5 bean loaded nachos! 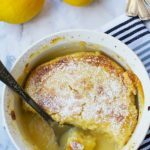 This is one of those basic but delicious recipes that are just good to know. They have everything. They’re easy. They’re nutritious. They’re versatile. They’re popular for a reason. You make them again and again and they never grow old. I hope this becomes an old favorite of yours too! 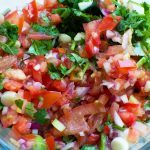 Next time you’re tempted to grab some ready made tomato salsa at the supermarket, why not grab extra tomatoes and make your own instead. 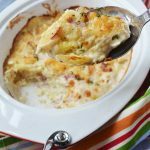 It’s simple and delicious, and only takes 10 minutes to make. 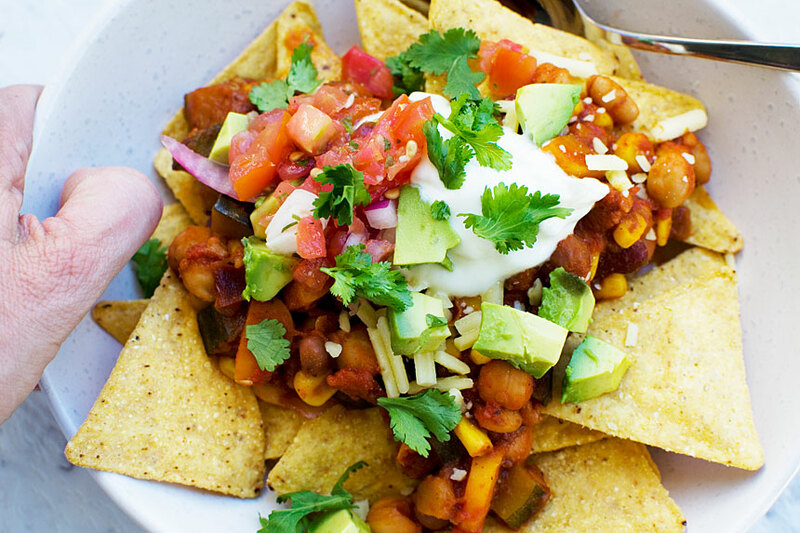 Perfect with 5 bean loaded nachos, or just scooped up with tortilla chips as a snack. Yum! 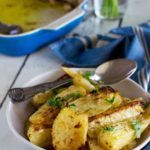 Serve immediately or keep covered in the fridge for a few days. Alternatively you can freeze the salsa for later. 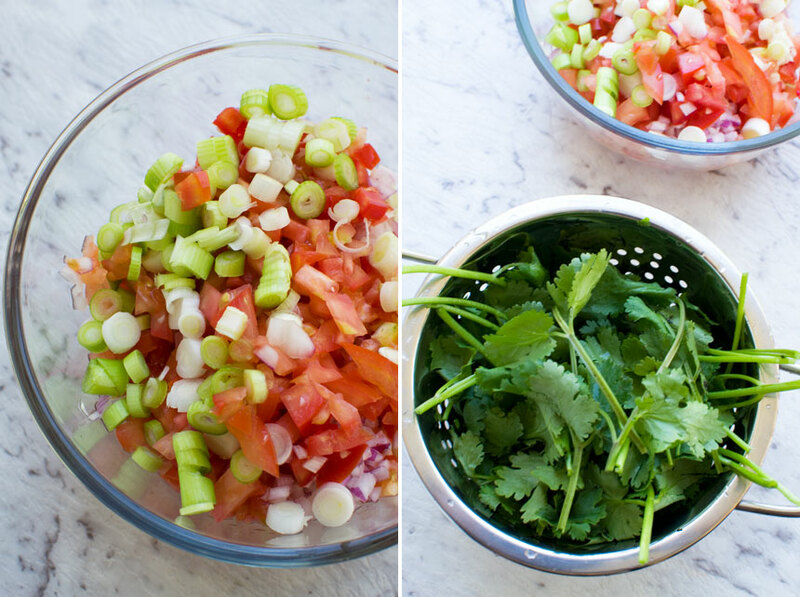 This salsa should stay fresh for 3 to 4 days in the fridge. You can freeze it if you like although you may want to drain off a little of the liquid after it’s defrosted. Very similar to how I make my fresh salsa, but I don’t add oil or vinegar. I do add Tabasco! 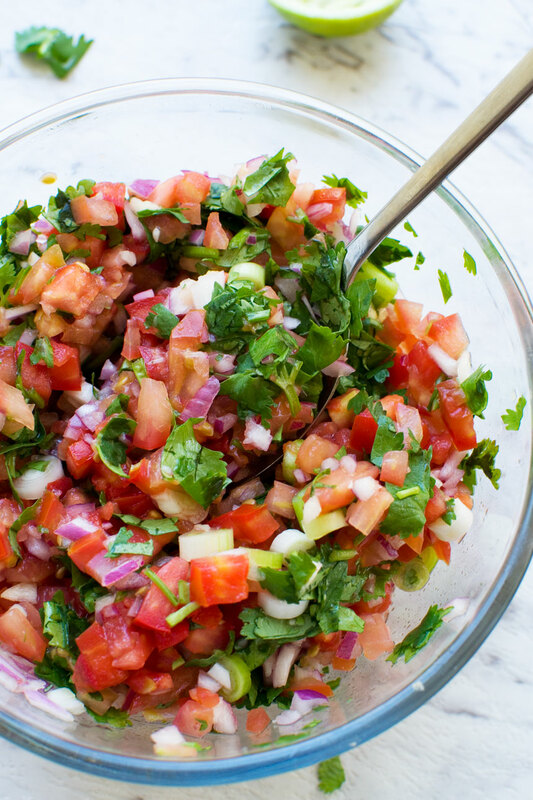 Homemade salsa is the best. 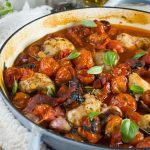 This recipe was SO easy to make! Thanks, Jillian – so happy to hear that! This was absolutely delicious, will definitely be making it again! Thank you so much for the feedback, Marsha!